For a true maintenance-free, easy-going garden staple that really wows, look no further than Camassia cusickii. This native of the Pacific Northwest United States produces delightful, upright racemes filled with dozens of soft wisteria-blue blooms accented by pale green centers with yellow anthers. Not only will this stunner dazzle in the garden, it also attracts beneficial pollinators, such as butterflies and hummingbirds, to the landscape. 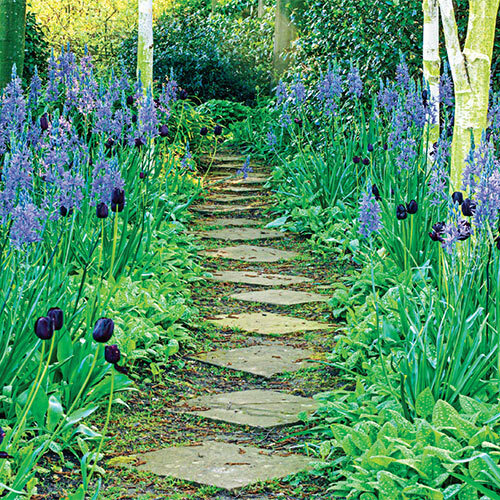 Camassia is a fast-growing perennial that neatly fills the gap between spring and summer flowering. It makes an outstanding addition to borders and walkways. It naturalizes like a dream when it is left undisturbed. Suggest planting them in damp soil where they will thrive. Camas have the signature strap-like leaves, with the flowering stem rising above the graceful cascade of leaves. Plant 6-8" deep and 6-9" apart. Full sun is best but has some tolerance of partial shade. Tolerant of many soil types and can thrive in heavy clay. Avoid dry soils. Plants prefer regular to moist conditions, but soil needs to drain well.